Gathered Nettles is borrowed from Hans Christian Andersen’s tale, The Wild Swans. 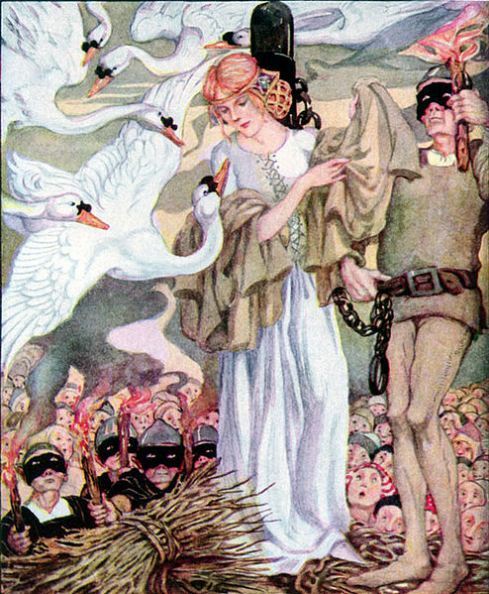 In the story, a young woman ventures to save her brothers from a curse that has transformed them into swans, by weaving shirts made of nettles that will restore them to their human form. She endures painfully blistered hands from nettle stings, and she must take a vow of silence for the duration of her task, for speaking one word will kill her brothers. She is seen gathering nettles from a church graveyard and is accused of being a witch. Since she can speak no word in her defense, she is sentenced to be burned at the stake. Before the fire, she throws the nettle shirts over her brothers and they are turned back in to men. The firewood takes root and bursts in to flowers, and the princess is spared from the flames. This classic tale incorporates several themes that we are interested in—the role of silence and the importance of speaking, female protagonists with a sense of agency, women’s power attributed to witchcraft, and the act of weaving or story-telling as transformation. In folklore nettles have a reputation for stinging and pricking, but if handled properly, can be cultivated for their healing powers. The image of the sister’s nettle gathering acts as a symbol for what we hope to accomplish in making this blog, which is to collect those stories that are often ignored or rejected by the mainstream. We would like to draw attention to works of fantasy, science fiction and historical fiction that feature female characters, LGBTQ characters, and characters of color in a leading role. We hope that in so doing we can stimulate not only our own creative processes but also challenge the way we look at and think about the world. That’s fantastic. Thanks for reading! I’ve just recently began a blog, the information you present on this website has been helpful to me tremendously. Thank you for all your time & work.